Steven Cohen's article "Indian or Persian?" in Hali , , regarding the three recently discovered 17th century classic carpets in San Francisco's Asian Art Museum (AAM) once again brings up the decades old controversy about just where the so-called “Indo-Persian” rugs were made. Rug specialists continue to argue over the Persian versus Indian origin of these rugs--an argument which has led to a bewildering array of designations: Herat, Esfahan, Indo-Persian, Indo-Isfahan, Indo-Portuguese, Lahore, Agra, Mughal, etc. During the first half of the 20th century the primary debate between rug specialists regarding the "Indo-Persian" rugs was whether they were made in Espahan, , as those in the rug trade contended, or in Herat, the area favored by most rug book authors. Few authors attributed them to India, although as early as 1900 John Kimberly Mumford , mentioned the similarity in their design to Lahore rugs. For mostly technical reasons, today these "Indo-Persian" rugs have been separated into several different groups, some thought to be Persian, from Espahan or Herat, and others Indian, from Lahore, Agra, or the Deccan. x. The controversial group [four-ply cotton warps] (later referred to here as "Group X"). The unifying feature of all the “Indo-Persian” groups is a crimson field containing a pattern of serrated palmettes along a central axis flanked by similar palmettes alternately facing inward and outward. Additionally these rugs display a dark green or blue border  usually of palmettes. Today, rugs from Group X are variously thought to have been made in Espahan in Central Persia (a place still favored by the rug trade), or made in Herat in Eastern Persia (the label usually reserved for the 16th century examples), or made in several places in India, particularly Agra (the city favored by some rug specialists). 1. Because some “Indo-Persian” rugs are currently thought to be Indian (Lahore), then the rugs of Group X which differ from them must be Persian. 2. Further, because the “Indo-Persian” rugs from Persia (Herat) use jufti-knotting and rugs of Group X do not, then the rugs of Group X cannot be from Herat and therefore must be from Espahan. Without extensive wool and dye testing it may prove to be impossible to determine where these rugs were made. However it would help to examine several questions which arise. 1. 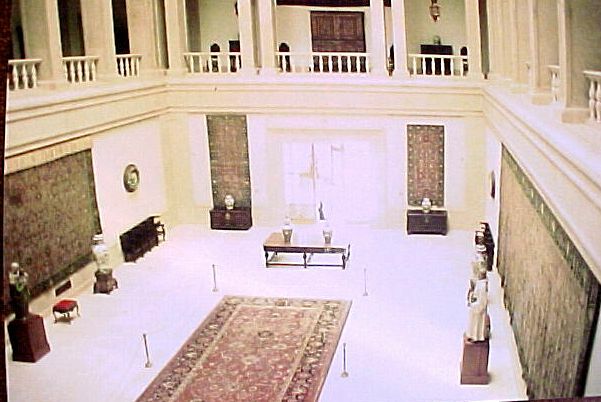 Now that one group of “Indo-Persian” rugs has been firmly attributed to India, namely the Lahore group (which includes the largest AAM rug, see photo, #1), why is there still such reluctance to believe that the nearly identical rugs of Group X (which includes the two smaller AAM rugs, , see photos, #2 and #3), could not also have also been woven in India? 2. Inasmuch as not all classic Persian rugs have 4-ply warps and not all Mughal rugs have 6-or more ply warps, does the presence of 4-ply warps in the rugs of Group X, as has often been maintained, make an Indian origin unthinkable? -- especially since some other groups of Indian rugs also have 4-ply warps? 3. Because the rugs of the Khorasan region in Persia, (a region which includes the 16th century Herat rugs), use jufti-knotting, does it logically follow that non jufti-knotted rugs of Group X could not have been woven somewhere in India instead of in Esfahan in Persia? 4. Why do the rugs of the Lahore group, the Herat rugs and the rugs of Group X all use the same dyes for their red and yellow colors (lac and weld)? And why, if the rugs of Group X were woven, as is claimed, in the same place (Esfahan) as the so-called “Polonaise” rugs, do the weavers of the “Polonaise” rugs use a fugitive red dye rather than the stable insect lac dye used in rugs of Group X? 5. Are the precisely drawn non-baroque designs of the rugs of group X really closer stylistically to the excessively ornate designs of the Isfahan “Polonaise” rugs? or are these rugs in fact closer stylistically to both the Herat and Lahore-type rugs? 6. If, as some specialists claim, rugs of Group X actually were woven in Esfahan (Persia), why do depictions of “Indo-Persian” rugs appear in so many 17th century Dutch paintings in contrast to the very rare appearances of the “Polonaise”, North Persian, Kirman “Vase” rugs or other well-known Persian types? Moreover, if the rugs of Group X were really the product of trade with Persia, why do not these familiar Persian rug types hang side-by-side with the numerous Indo-Persian rugs in the Museu Nacional de Arte Antiga in Lisbon? (photo) The fact of the appearance of the rugs of Group X in both 17th century Dutch paintings and Portuguese collections accords with the fact of robust trade between India and both the Holland and Portugal during this time. 7. Why is it that both rugs from the Lahore group and rugs from Group X which were once stored at the palace at Jaipur have labels which document them as being products of India? 8. Indeed, what has then happened to all the rugs made in Agra mentioned in 17th century sources? The largest of the three AAM rugs belongs to Group b, characterized by tone-on-tone coloring, the presence of wisteria type blossoms and 6-ply cotton warps, a group now generally accepted to be Mughal rugs made in Lahore. The other two AAM rugs belong to Group X, whose place of manufacture remains controversial. Early rug scholars called the rugs of this group “Herat” because of their similarity to the elegant sixteenth century rugs believed to have been woven in that city. Today, however, many dealers and most auction houses attribute these rugs to Esfahan in Persia while other specialists attribute them to Agra in India. We cannot assume that because rugs of Group b, namely the Lahore Group, is now believed to have been made in India, that rugs of another group of “Indo/Persian” rugs, namely rugs of Group X could not also have been woven in India. Because of their related designs or similar weaving techniques, several other types of rugs are also associated with Group X-namely 16th century Herat rugs (Group a), silk-warped “Esfahans” (Group d), the so-called “Portuguese” ship carpets, the Khorasan “Tree-Shield” carpets, as well as the silk and metal “Polonaise,” and the 17th century Mughal/Persian multiple niche prayer rugs. In an effort to unravel the mystery of just where the rugs of Group X were woven, whether in India or in Persia, we will have to consider not only their commercial history but also their various technical properties-(a.) warp ply, (b.) knotting techniques, (c.) type of wool, (d.) dyes, and (e.) design. The characteristic use of 4-ply cotton warps in classical 17th century Persian rugs has been put forward as the strongest argument for also assigning to Persia (Herat or Esfahan) the rugs of Group X, which for the most part have 4-ply cotton warps, unlike Indian Mughal rugs which commonly have 6-or more ply warps. It should be noted, however, that not all classic Persian rugs without exception have 4-ply cotton warps, and likewise that not all classic Indian rugs have 6-ply or more warps. On the one hand the Von Hirsch Persian fragments, the Getty “Polonaise” rug and the Ballard Persian design saf fragment all have 6-ply warps but, on the other hand, the famous McMullan Mughal prayer rug in the Metropolitan Museum has 4-ply warps! Other classic Indian rugs with 4-ply warps include the “Deccan” saf group, a little known rug in the Kuwait National Museum and scattered fragments from the once gigantic rug from the Palace of the Forty Columns at Isfahan, a rug which has several important esthetic features in common with Mughal carpets-- realistic green leaves, tone-on-tone coloring, and colored outlining. Moreover, according to Charles Ellis, the presence of red silk wefts provides further evidence for an Indian origin for this rug. The presence of 4-ply warps in the carpets of Group X does not, therefore, automatically exclude a Mughal origin. Some modern rug scholars reject both an Indian and an Eastern Persia (Herat) origin for the rugs of Group X. They assign them instead to Esfahan, a weaving center in Central Persia, the region where perhaps for commercial purposes many early 20th century dealers such as Vitall Benguiat also placed them. Because Jufti-knotting  characterizes 16th century Herat rugs as well as other rugs from Eastern Khorasan, current reasoning asserts that rugs of Group X cannot be from the same Khorasan area as the Herats because they rarely use jufti-knotting. This fact, however, does not preclude the rugs of Group X from having been produced in India. It should also be noted that jufti knotting is found in two other groups of classic rugs--in the so-called “Portuguese ship” carpets, and also in the multiple tiered prayer safs. While both of these groups in the past have been attributed to India, the presence of jufti-knotting has persuaded some modern rug specialists that the 16th century "Herat" and the "Portuguese" rugs were made in the Khorasan region, where jufti-knotting has been traditional. The depiction of Portuguese ships and sailors makes more sense in an Indian rug than in a Persian one. The design perhaps celebrates Portuguese/Indian trade relations. It seems that technical considerations such as jufti-knotting can lead to conclusions which may not be valid. Pashmina wool, a defining feature of the finest Indian Mughal rugs, also occasionally occurs in 16th century Persian “Herat” rugs (Group a), rugs whose designs and coloring are similar to those of Group X. Although these “Herat” rugs are generally assigned to Persia, the use of pashmina wool and lac dye and the similarity of designs to those of the “Indo/Persian” groups, indicate that these rugs may, instead, have been woven in India. Although similar shades of crimson red, dark green and gold are common to all the “Indo-Persian” rugs, those of Group b (the Lahore group) almost without exception have a brighter palette than those of Group X. It is not uncommon for Lahore rugs to have as many as 16 distinct colors, including four different shades of red, two or three shades of green and strong purple dyes. In contrast those of Group X seldom have more than nine colors. The different ways these groups use color, such as the Lahore weaver's use of tone-on-tone coloring, help us to tell apart one group of Indo-Persian rugs from another. But while color distinctions help us to place Indo-Persian rugs into different groups, the fact that some rugs do not conform to the typical Indian use of color does not automatically exclude them from having been produced in India, perhaps in a different area. The subtle differences in these rugs could be due to court versus factory production. Factory production would dictate the use of inexpensive, readily available dyes. We know from various contemporary archives and travelers' accounts that there were numerous rug weaving centers in India. According to dye analysis cited in Walker's important book on Indian carpets, Flowers Underfoot, the rugs of Group X and those of Lahore use some identical dyes-- lac (indigenous to India) for red and luteolin (weld) for yellow. Both the use of lac and use of weld, especially in the absence of madder dye,  point to an Indian origin for both of these groups. In contrast, several of the 17th century Persian Topkapi rugs use a combination of lac and either madder or cochineal for their red dyes and semibarbatum delphinium for yellow. Would it be likely that weavers from Esfahan would have used for their red dye imported lac such as we find in group X rugs instead of locally produced madder? If both the rugs of Group X and the “Polonaise” rugs were woven in Esfahan, why were not the same dyes used for both groups? Why would the Esfahan weavers have used a fugitive scarlet (safflower?) dye for their silk and metal “Polonaise” rugs if lac had been locally available? Because the weavers of Group X rugs used lac and leutolin dyes but did not use madder for their red dyes (and because they did not use jufti-knotting), it appears that India would have been the more logical place of manufacture for them than either Esfahan or Khorassan. Aside from very minor differences, the designs of the Lahore rugs (Group b) and those of Group X are so alike that casual observers, even experts, have been hard pressed to distinguish between them. In fact, there are no two groups of rugs so nearly identical in design. Occasionally a rug of Group X will have a lattice design similar to an Espahan “Polonaise”, (for instance one of the three AAM rugs, has a simple lattice design closely related to two of the “Polonaise” rugs in Berlin. The lattice design was extremely popular in the 17th century in both Persia and India. That rugs of Group X share a common design with some of the Espahan “Polonaise” is hardly a good reason for assigning them to Espahan, especially since the baroque interpretation of the lattice design in the “Polonaise” rugs is so unlike that of Group X. Certainly judging from their design and use of color, the blossom designs of sixteenth century “Herat” rugs are Group X rug's most obvious antecedents. The same designs, with similar colors are woven in Agra even to the present day. While we do know that rugs indeed were woven in 17th century Espahan, and that the East Indian Trading Companies used Persian ports to ship these rugs to the West, these “rich carpets of Persia”, were most likely the luxury rugs of silk and gold frequently referred to in 17th century reports. i.e. the so-called “Polonaise.” These rugs were found to be too expensive to sell at a profit. Many rugs of Group X can still today be found in Portuguese museums. It should be noted that large numbers of this group were exported to America in the 1920's by the famous rug merchant Vitall Benguiat who had purchased them from sources in Portugal and Spain. While most rug specialists of the early 20th century believed that the “Indo-Persian” rugs were woven in Herat, Vitall Benguiat, who was illiterate, insisted on selling these “Indo-Persian” rugs as “Royal Ispahan”, despite the objections of his cataloguer who had studied the current scholarship. While The East India Companies carried on trade with both Persia and India, Western collectors and dealers have found few Persian carpets in places where the “Indo-Persian” rugs were directly imported i.e. Portugal and Holland. Rarely do Persian rugs--either North West Persian or “Polonaise”, or “Vase” Kirman rugs appear in Western paintings. The “Polonaise” rugs of Isfahan and Kashan as well as the North Persian rugs, seem to have found their way into Western collections via overland routes. They have mostly been found in Italy and France, brought to Europe either by diplomats or by traders via the overland silk routes, or, in the case of the Kirman “Vase” carpets, found in Persia where they had remained in mosques until sought out by Westerners in the early part of the 20th century. The large number of Group X rugs which have survived indicates a factory operation and a readily accessible supply of rugs. Only during the time when trade with India was well established did a remarkable number of Group X rugs appear in Holland and Portugal. Although the India vs Persia controversy may never be resolved with certainty the published evidence to date strongly suggests an Agra, Lahore, or Deccan origin for Group X rugs. The fact that certain types of Indo-Persian rugs are now classified as having been made in India  appears to confirm the conculsion of such rug scholars as C.G. Ellis, May Beattie and Murray L. Eiland  that most, if not all of the Indo-Isfahans are Indian rather than Persian. Copies of this work may be reprinted provided no changes are made to the text. Otherwise, all rights reserved. “Ispahan” refers to the Persian city while “Espahan” refers to the region in Persia. There is a small group in which the colors of the field and border are reversed. These rugs have, in their spandrels, depictions of ships carrying what seem to be Portuguese sailors. See Michael Franses, “Catalogue of Persian-Design Niche Rugs” pp. 78-79 in Oriental Carpet and Textile Studies Vol V, part 2, , 1999. Prayer rugs,op.cit. p. 78 PL XXIII. See “The Pasha and the Magic Carpet” part 2 by Wesley Towner Hali Vol 3 #1 p. 13. A knotting technique in which wool is circled around four rather than 2 warps. M.L.Eiland, Chinese and Exotic rugs, 1979, p. 158 and Steven Cohen,”Safavid and Mughal Carpets in the Gulbenkian Museum, Lisbon” , Hali 114 p. 76. See Irwin Journal of Indian Textile History 1955, p. 19 for Agra and Lahore; see Ydema, Carpets and Their Datings in Netherlandish Paintings, 1991, p. 77, 78, 79 for Fathepur Sikri, Ellore and Masulipatum; see Walker. op.cit., pp 12, 19 and 20 for Kashmir, Amber palace, Multan, Jaunpur, and Surat and Ahmadabad in Gujarat. Mark Whiting, "Dye Analysis in Carpet Studies", Hali I # 1 p. 42-43, and David Black ed., The Macmillan Atlas of Rugs and Carpets, note b. p. 22. Friedrich Spuhler Oriental Carpets in the Museum of Islamic Art, Berlin 1987, pl 84 and 85. Ydema, op.cit. p. 60. chart. Irvin, op.cit, p. 19-20, and Ydema, ibid., p. 60-61. Robert Pinner footnote 3, "The Pasha and The Magic Carpets", Hali Vol II #3 p. 191, "Spain was an excellent source for Benguiat's Spanish rugs and Portugal for the 'Indo-Isfahans' which he sold in large numbers to his less discriminating wealthy clients." Wesley Towner, "The Pasha and the Magic Carpets, Part 2", Hali Vol III #1 p. 12-13. The Deccani group for example. see Walker, op.cit., fig. 140 and S. Cohen "An Indian Enigma" Hali 118. 1979 In Chinese and Exotic Rugsop.cit., "The Rugs of India," Murray L. Eiland covers the subject of Indo-Persian rugs exhaustively--dividing the Indo-Herats into the classification 3a [Lahore group], 3b [controversial group], and 3c [Herat group]. He deals not only with dye analysis, weaving technique, and the Jaipur inventories, but also discusses Persian and Indian miniatures, designs on contemporary Persian and Indian archetecture, and the appearance of rugs described as "de la India de Portugal" in 17/18th Spanish inventories.